Waking up at 5:30 on a Saturday morning is hardly my idea of fun, but to make sure that I could get out the door and across town in time to meet the group and get my initial orientation. It might be SoCal, but when I got out the door, at just after 6:30, there was still quite a chill in the air. I set my mind to the task of getting my body warmed up for the upcoming ride, stretching and contorting myself into various forms as I rode along to make sure that my back and shoulders would not tense up over the course of what would be one of my longest single rides to date. When I arrived at the parking lot of the El Dorado Public Library, several of Lightning Velo's members had already arrived and were congregating to get their day started. I introduced myself to one of the ride leaders and got situated with a group. At promptly 7:30, the faster "A" and "B" groups took off on their ride while the more casually paced "C" group waited until the faster riders cleared out to set off in a large mob. With about two dozen riders that morning in the "C" group, and two of us newbies among them, the decision was made to split the group in two to allow easier travel through stop lights as well as keep the pace lines reasonable in length. I started in the back, observing the behavior of the more experienced group riders in front of me. Luckily, the pace was causal enough that I hardly had to get my heart rate up to stay with them and this allowed me to focus my attention on the more experienced rider who was giving me some tips and pointers about riding in a group. Through the first few miles, I casually sat back and spun away, trying to maintain about a half of wheel of distance between me and the rider in front. Before too long, the lead riders peeled away and the first switch of the pace line took place. When the road was sufficiently and wide enough and clear enough, the two lead riders slid to the outside of their respective lines and the second set of riders slid up to become the lead riders. Watching this rather precise movement, clearly a well practiced routine for the experienced ride leaders, was to marvel at a well oiled machine. 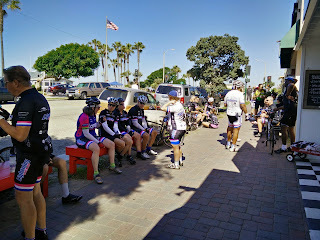 As we progressed further south towards the beach community of Huntington Beach, the winds began to pick up and it was not long before the second set of riders to lead the group became tired and executed the maneuver to slide to the back of the pack. Another couple of miles down the road, the lead riders peeled off and I finally got my turn at the front, pulling the group for a while. The rider to my right, a rather intense and intimidating looking gentleman, set the pace as my bike is not yet fitted with a speedometer. We pushed hard for several miles, a lot of it heading directly into the wind. Since I had been sitting in the line during the first miles of the ride, I was surprisingly fresh and ready to push hard. It look all my will power not to ratchet up the pace to add more speed since my legs were hankering for more punishment. But I kept the pace with my silent companion and we pressed on for a solid four or five miles before he called it quits and we peeled off to return to the back of the line. This cycle would continue for a total of 30+ miles, every pair of riders taking their turn at the front of the line to break the air and pull the riders behind. At various points, there were some switches in the line order due to coach-able moments as the other newbie to the group struggled at times to keep the pace. I took the opportunities to chat with the group, learning a bit about several of the members and listening to the stories of exploits from past rides. I started to understand why people made the effort to get up so early on the weekends to come out and join these rides. Our final destination as a group was a coffee shop near the waterfront in Seal Beach. As we rolled up to regroup, I was feeling surprisingly fresh, my legs hardly feeling like they had been riding at all for the past 30+ miles. I hung around a bit to chat with a few of the fellow riders, but it was not long before the group dispersed to return to their individual lives. Rather than follow the group back to the library, I opted to head back home and get cleaned up to start the rest of my day. As I climbed the small hills and faced into the stiff headwind during my final miles, I could not help but wish that I could be with the group at that moment, another rider ahead of my to help pull me through the wind. At the end of my full day of riding, I discovered that I was far less tired than I usually am when I ride solo. Given that this was my first time participating in a group ride, I will chalk that up in part to the rush of a new experience, but it seems clear to me that riding with a group is far more efficient that riding on my own. In order to continue to get stronger and faster, I will need to participate in more of these rides and focus on developing my skills to eventually move up into the more intense groups as I get stronger. No matter if you are normally a solo rider, I think that every rider should experience the group ride at some point. If even a staunch solo cyclist like me can find such joy in the group experience, I think just about any rider would be able to do the same. A special thanks to Lightning Velo for providing such a great experience to a novice group rider. I look forward to returning in the not too distant future.